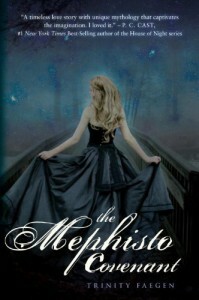 Review posted on Dark Faerie Tales.The Mephisto Covenant has a gorgeous cover. I remember when this first came out. It was something that I had to have and it looked like it belonged on my shelf. The Mephisto Covenant by Trinity Faegen is a great read. Paranormal is one of my favorite genres, and I think Faegen did a good job balancing the realm of good and evil. Hell has two sides. One with death and destruction, and the other living life in purgatory. Of the two, the sons of Hell live their lives battling against their oldest brother. Jax looks to redemption from God, from a promise that he will find peace if he has found the love of an Anabo. Sasha does not know of this world. But the death of her father has opened her eyes to things she was never aware of. Promises of love, pledging her soul, Sasha must choose. And as for Jax? He must keep her safe, even if it means that he won’t be able to have his forever.I enjoyed Sasha. 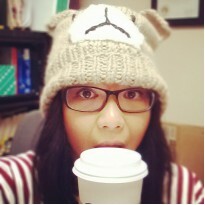 At times, she was a bit bothersome, but that is the case for most teens her age. Given that she’s lost her father, about to lose her mother, it’s okay to question and be agitated. She lives with family that doesn’t necessarily want her, and that must hurt. Her voice was realistic, despite anything thrown her way. There were a few moments where I had to glaze over her scenes, but I felt that it became repetitive. Her actions weren’t something that I wanted to experience at that moment, but it has a lot to do with my age and less about the character and/or writing. Jax was a perfect character to introduce me with! He was someone strong-willed and tenacious, but had this soft spot. The history behind Anabo’s and the sons of Hell is interesting, and looking at the story from Jax’s point of view made it much more enjoyable. His growth as a character was one of my favorite parts of the story. (As well as some steamy scenes that include him! )I loved the mythology and lore behind The Mephisto Covenant. The religious theme behind Hell, Lucifer, the Anabo and the sons was a good twist. It made the content seemed updated, fitting for the young adult genre. Sasha and Jax stood out as a couple, but also as characters. Each with their own troubles, it was nice to see their parallels and contrasts. At times, I felt that the content was a little too advanced for this specific genre. I worried about the context of the situations and wondered if I was overthinking the situation or if I had a valid thought. There were definitely scenes that were hot and racy, but as The Mephisto Convenant’s mythology dictates, things were bound to happen. They were some of my favorite scenes, but wow. Faegen’s writing is beautiful. Her words flow so well that time passes by. Her world building is magnificent and I enjoyed each detail within. Her characters captivated me, demanding my attention. I cannot wait for the rest of the series to unfold.